Hello and summer is here! So I thought a mermaid card would fit right in with the current weather. I love creating cards with texture and beautiful colors. I mostly stuck with the aqua colors on this card and I love the look. The mermaid pops out with her glittery tail. Don't you think? Dawn this is so super cute! I love SOG!!!!!!! I just love mermaids. Love the way the hair turned out, colors, everything. Great job! Such a cute card Dawn. Your colouring is fab and I love the glitzy tail! 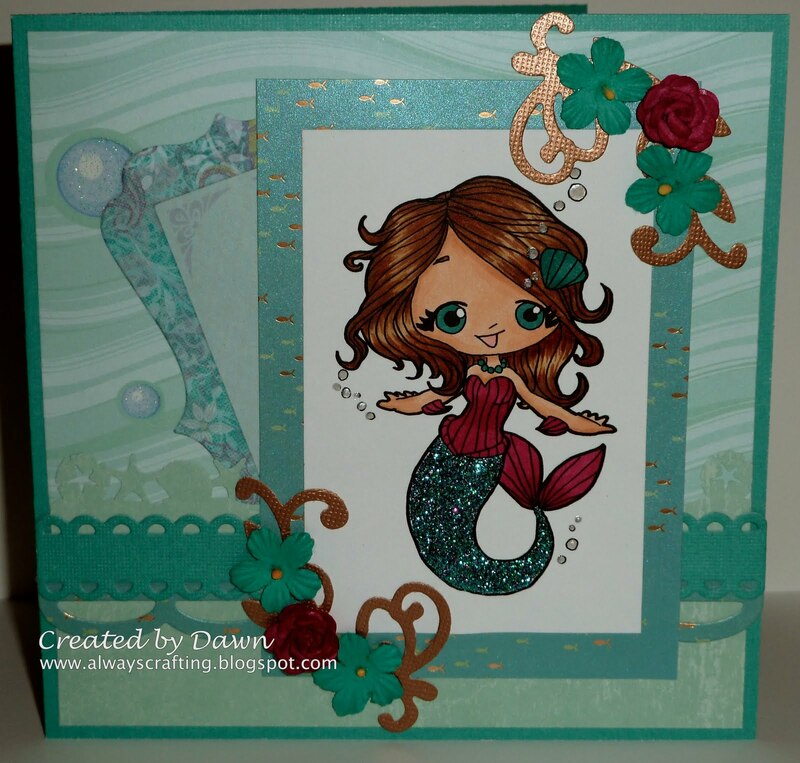 Thanks so much for joining in with the Under the Sea challenge at Cardmadfairy's Digi Days. Very pretty and I love her glittery tail too! Thanks for playing along this week at Paper Sundaes! Beautiful card. I love the glitz on her tail. Thanks for joining us at For Fun Challenges this week! Cute card! I love the sparkle on the mermaid's tail!! Thanks for playing along with Shopping Our Stash! I just love the colors you used on this card and that cute mermaid! Thanks for joining us at Shopping Our Stash! Thank you so much for playing along with us this week at SOS. This card is just too cute Dawn. Love your little mermaid! Thanks for playing with us this week at Going Grey with Scrap Creations and Good Luck! She is adorable Dawn, fab colours. fab card with a fantastic colouring! Love it! Beautiful coloring and great papers! Thanks for joining us at Paper Sundaes and SOS! I think this is a lovely card...really love the papers you have teamed with the mermaid. Thanks for entering our Underwater challenge at Cardmadfairy Digi Days.